How do we help women to shine within the workplace? 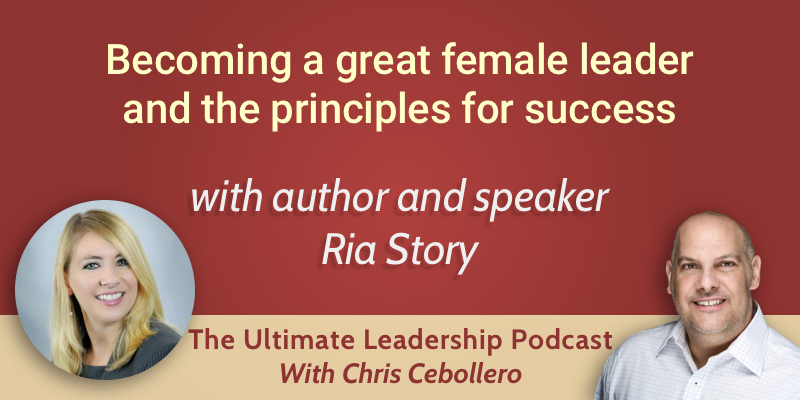 Today’s guest, Ria Story, overcame a tragic childhood to become a successful and confident leader, and motivates other female professionals to help them reach their full potential. She joins us to discuss gender bias in the workplace, the correlation between success and positive attitude, and confidence and authenticity. How important is authenticity in the workplace? Ria used to have the impression that she wasn’t a natural or gifted leader, until she realised that leadership is defined by influence. We influence everyone around us, so the key to becoming a great leader is figuring out how we can influence people positively. When you approach leadership in this way, you realise that leadership is indeed a verb, not a noun, and that in actioning it you can influence someone every day. These principles apply in the workplace at all levels, as you can influence your peers, your team, and your manager, but also at home where you can influence your spouse and your children positively. The motivation behind this publication came from Ria wanting to write a book that contained concepts and principles of leadership which she wished she’d known when she started in her career. As there are more than 30 characteristics of very successful women, she thought it important to pick the most impactful principles which would have helped as she transitioned and progressed in her career as it’s important to share wisdom, knowledge and experiences to others facing the same obstacles. Ria says that her biggest challenge in the workplace which she needed to overcome to be able to improve herself and progress in her career, was herself and her own limitations. She wasn’t a natural communicator as she had grown up in an isolated and abusive environment, and wasn’t a natural in conversation. As she grew in her career, she worked to improve her communication skills as she recognised how important this is to be able to become a successful influencer. Leadership is something in which we can all improve on and get better at, and the tried and true principles which have been around for a long time are all noted in Leadership Gems for Women: 30 Characteristics of Very Successful Women. The principles work in every situation, and it is a natural progression for influence to increase if we take the principles and do them well. It is critical to be authentic in the workplace, and to represent yourself in a true and honest way. Authenticity is sometimes incorrectly perceived as a weakness as it does require us to be vulnerable, however if we are able to admit to not knowing an answer to something or to admit to making a mistake, it builds trust with people around us. No one is perfect, and people want to know that leaders know they’re not perfect and are comfortable admitting that. We are all human, and we all make mistakes. Our influence increases when we can be authentic and acknowledge those strengths. We don’t become better leaders by pretending we’re perfect, we become better when we’re able to overcome things. Being successful comes down to the attitude of being positive. When we’re positive while everything is going right, it doesn’t increase influence as that is what people expect. However, when things are going wrong and we’re positive, that’s when influence increases. There are three ways to be more positive. These are with our thoughts, our actions, and our words. Embrace opportunities as a chance to be creative, read positive books and volunteer to help someone, and replace the word ‘can’t’ with ‘how can I…’. Negative thoughts become negative actions and behaviours, so to influence people and to become a great leader it all stems from positivity. We all have two types of confidence. The first is self-confidence which is our values, our beliefs, are confident in who we are and what we will stand up for. This is enhanced by lessons and experiences in life, and it doesn’t change regardless of environment. The second kind of confidence we have is situational confidence. This is the knowledge we have and is more competency-based. This does change, as the situational confidence we have on the first day of a new job will be different to when we’ve been there a long time. Ria’s advice is to balance both character and competency and to put time and energy into improving skills whilst not forgetting to improve the character as the latter is static and doesn’t change. Have a personal growth plan. People work hard to put themselves in a position to be successful, but don’t put time into their own professional development to grow. If you’re not willing to invest in yourself, no one else will be either. Women feel a lot of pressure in the workplace to be the leader who has all the answers, and there is pressure on them to be leaders who give the impression of someone who has it all together. This pressure can be relieved if men are authentic and admit to not having all the answers and making mistakes, as it then creates an open culture for women to do the same. If we value the strengths and differences of our team regardless of gender, it opens up the opportunity to make the team strong as we work with our strengths together. What we permit as leaders is what we promote, so there needs to be a lack of tolerance of bias from those who influence others. 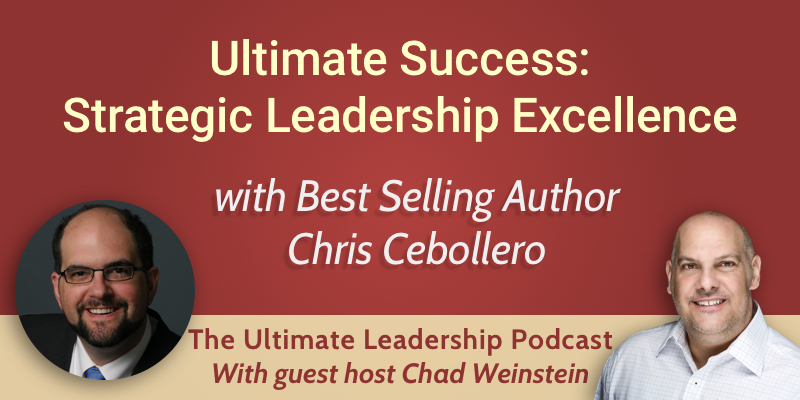 We have a very special show this week – your host will be me, Chad Weinstein, and our guest is Chris Cebollero, author of the new book Ultimate Success: Strategic Leadership Excellence, which has reached bestseller status on Amazon. 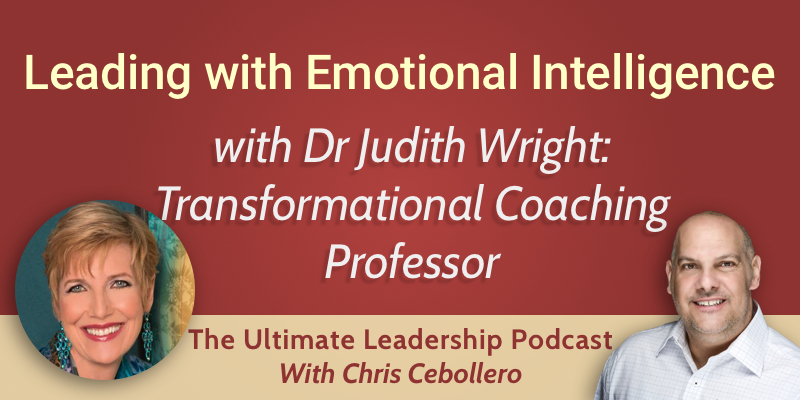 We discuss Chris’ new book, the lessons within it, and why continuous development is critical to leadership success. What motivated Chris to write this book? What were the surprises that came out of writing this book? How should readers use Ultimate Success for their development? Chris Cebollero’s first book, Ultimate Leadership: 10 Rules for Success, was about the rules he had to come up with through his leadership career that really grew from the lessons learned from his professional successes and failures. In the new book, Ultimate Success, Chris set out to give the reader the skills and knowledge that they would need to develop into an ultimate success as a leader. Are you born to be a leader or are you made to be a leader? Chris believes the answer is ‘yes.’ Leaders are born, but as we grow we are able to develop our leadership acumen – so both are true. Chris wrote the book to act not only as a foundation but also as a resource that leaders can reference throughout their careers to continually help them to develop. So it is designed to be of value to seasoned leaders as well as those that are stepping into leadership positions for the first time. Leadership is both an art and a science. You’ve got to know the science before you can paint the picture of success. Especially true for new leaders. But also very relevant for experienced leaders as Chris is setting out his interpretation of the science through this book which will encourage you to look at leadership practices in a new way. It provides an opportunity to question and clarify your thinking. 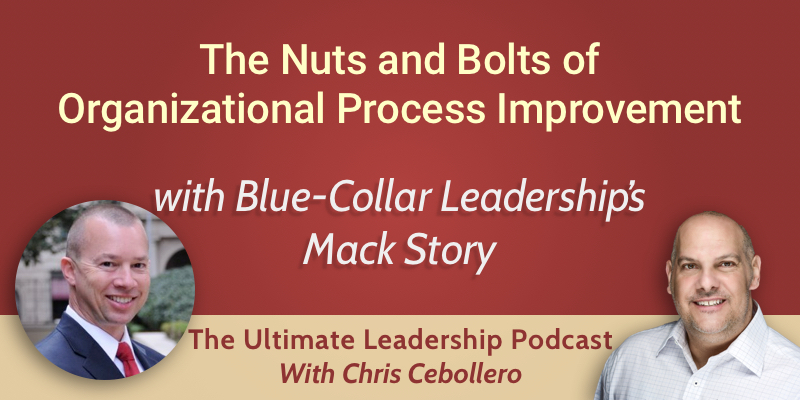 John Maxwell is a stand out example for Chris. When you think you know about leadership and you sit in front of John, says Chris, you realise how much you don’t know about leadership. Chris is also inspired by leaders through history that went through tragedy and came out successful. Winston Churchill, Harry S Truman, John F Kennedy, for example. People that had to go through and deal with extreme adversity and come through successfully. Coming from the public service realm, Chris was mentored by leaders in his chain of command who seemed to have all the answers. When he would come to them as a young paramedic or young supervisor, nervous and concerned at how to handle situations, it seemed that they always knew what to do to deal with a given problem. People like Ernie Rodriguez and Randy McCargar, and Jennifer Cordia that really impacted Chris’ career early on. Another hero was his first boss when he left the military: Don Hopkins. Don was a rural hospital president who really set Chris on the path into the private sector with the tools of how to talk and interact with people in the proper manner. Don moved Chris’ mindset from a military one to a civilian one. What surprised Chris was that as he was putting his thoughts and experiences down on paper, it brought him back to not only what he had to learn in the early stages of his career, but that he continued to enhance those learnings throughout his career with a huge amount of those experiences that go into honing your craft. Going back through the stories and experiences that molded his career brought back some surprising emotions, but also reminded him of just how much you learn and develop through your life. Chris has laid bare some of these experiences openly in the book as well as sharing the successes of those around him. Ultimate Success is not so much a how-to, but rather a framework of tools based on the stories and experiences that he shares that the reader can fill in to develop their own success patterns. At some points, it acts as an overview of a given topic – communication for example – and at others it goes more in-depth with clear takeaways and advice – like the section on presentation skills in both formal and informal situations. It’s important to remember that as a leader you’re on stage as soon as you leave the house. Every time you leave the house, it acts 1, scene 1, action! Your work force is always watching every move you make – whether that be from a position of trying to emulate what you’re doing or from a position of noting your errors and failures and questioning your ability as a leader. The book gives you the advice you need to put yourself in the best possible position to portray a positive public image and to ensure that when you join a team, the moral, collective attitude and performance goes up. Leadership is not a noun. It’s not a position or an achievement. It’s an action – and you need to be able to develop that action every day to make sure your workforce can be the very best that they can be. This is a book you can read as a leader, get the foundational knowledge out of it and then share that knowledge with your workforce. This could be in the format of a discussion around one of the chapters in a weekly meeting, covering a particular topic and sharing best practices in a mastermind setting. It can also be used as a reference when needed. It’s important to remember that even as experienced leaders, we have to develop continuously or we’re establishing a status quo instead of moving forward. The book offers an opportunity to questions ourselves and continue to hone our craft. Chris also provides guidance and coaching to individuals and leadership teams to help them implement these best practices within their careers and organisations. By assessing and determining core strengths and areas of weakness, Chris can provide actionable advice to help you address areas of your leadership practice to drive towards ultimate success. If you’re looking to grow your professional development, you can find Ultimate Success on Amazon. I’ve got to say, I think the answer is no. The only thing we can do is manage our processes within time. And whenever I work with people on time management, one of the things I share with them is: How are they able to do as much as they can in the allotted time of the project. Well today’s guest is an expert in time management. Elizabeth Grace Saunders is the founder and CEO of Real Life E® a time coaching and training company that partners with individuals on the journey from guilty, overwhelmed and frustrated to accomplishing more with peace and confidence. Elizabeth’s is an accomplished author and has appeared in Inc magazine, The Chicago Tribune, and on NBC, ABC, and CBS. She was selected as one of the Top 25 Amazing Women of the Year by Stiletto Woman. Please join me in welcoming Elizabeth Grace Saunders. Why do we need to define our priorities to invest our time well? Why is saying ‘no’ important to prioritising? How do you say ‘no’? For Elizabeth, starting a time management coaching business was a case of scratching her own itch. After struggling to complete projects on evenings and weekends, she developed a system to allow herself to separate her work and personal lives and still achieve the things that she wanted to. In 2009, her entrepreneurial friends convinced her to help them with the systems she had developed, as they were struggling with the time it took to run their businesses and the stress that this induced. She has been in business for 8 years and seen some amazing successes. 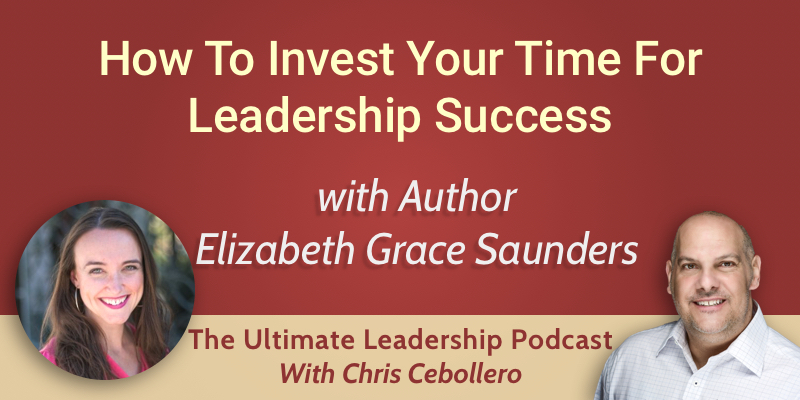 Elizabeth sees time investment as the next level of time management. Time management is about efficiency: How can we get more done in less time. Whereas time investment is focused on effectiveness. So the primary question is: What are the most important things to get done, and how can we get the right things done to the best possible level? It’s a mental shift where we step off a constant feeling of overwhelm with too much on your plate, to a sense of clarity on what really needs to get done. What is most important, how do we achieve that, and being OK with letting the rest go. The reason is that if you have defined your priorities, then it becomes your decision-making rubric that determines the most essential items to get done. When you have defined and internally decided what is most important, then everything becomes clear. It’s not about pleasing people, about getting things done, about inbox zero. It’s about what is most important to you. So at the end of the day, if you know that you put your time into what truly matters to you, you can feel awesome. Regardless of whether you got everything done. This can be on paper or electronically. Those priorities can include work, family, friends, health, social activities, sports. Whatever the important priorities in your life are. What is the most important thing for you to achieve? Note this down and then move down to the next most important and so on. It’s then important to plan out time enough to cover those upper-level priorities before moving on to investing time in the lower-level priorities. Ensuring you have enough time to cover the most important things in your life brings a higher level of balance to your day-to-day. Because often, the most important things to us, like family or spirituality, can get pushed out by work. So when you are faced with a decision like whether to take on a new client, do a particular promotion, do a particular activity, you can look at your decision-making filter based on what is true for you and determine whether it will take time away from the higher-level priorities in your life. To put these priorities into action, you need to convert them into actionable items that can go into your calendar. Hypothetically, someone that is married with children might decide that family is a priority to them. One of the things they could do is decide that there are certain things throughout the week that are sacred to them and their family and so it will always go into the calendar. That might look like that three nights a week, they will be home in time for dinner with the family. Or that Saturdays are work-free days – the laptop and work phone stay away which leaves dedicated family time. Health and wellness is easy to overlook, so if it is important to somebody, it should go into the calendar. This can be as simple as a reminder in their calendar to go to bed at a certain time, to remind them not to switch off and ignore work calls or emails. Or exercise: Translating this goal into items in your calendar like a 30 minute walk or a crossfit class can ensure that they don’t leave out this top priority in their life. Exercise is a nebulas, easy-to-forget activity, so by consciously blocking out time in the calendar for them, you ensure they don’t get lost amongst the busyness of life. If we don’t say ‘no’ to the things that are not our top priorities, we will not be able to say ‘yes’ to the things those top priorities. By not saying ‘no’, we are living a reactive life, not a proactive one. And when we live a reactive life we are living in alignment with other people’s priorities rather than our own. It’s obviously not that we have to say ‘no’ to everything, but it’s important to be conscious of the effects saying ‘yes’ will have on our top list of priorities. One of the major things that Elizabeth has found to be an issue is that people that struggle with saying ‘no’ often fall within the ‘obliger’ category as described by Gretchen Rubin in her Four Tendencies. Obligers are people that want to make others happy – and they can often find it difficult to say ‘no’ to people for various reasons. It’s important to remember that you’re not saying ‘no’ to the individual, you’re saying ‘no’ to the request. Elizabeth recommends a list of scripts that gives excellent examples of how to politely and inoffensively saying ‘no’. You can get that list of scripts here or by texting ‘justsayno’ to 33-444 which will message you back with information on how to get access to these scripts as well as other tools and resources that Elizabeth has compiled. The book is available in print, e-book, or audio on Amazon.